Congratulations flowed last night as Jamaicans who had gathered across the island celebrated as Tessanne Chin wins The Voice USA season 5. 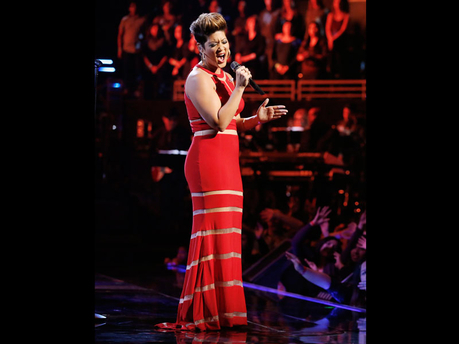 Tessane Chin wins the voice usa and walks away with a recording contract and US$100,000. High on the list of those hailing the singer’s win in the American talent competition was Prime Minister Portia Simpson Miller. “You have been a fine ambassador for Jamaica during this grueling competition and your voice, your victory, will now serve to set the new standard for others to follow. Minister of Youth and Culture Lisa Hanna also showered Chin with praise. “Tessanne was the best voice and performer on the program,” Hanna said in a statement issued just minutes after the announcement. “I speak on behalf of the country when I say that we are all happy for her success. I am very pleased that so many more people across the world did get, and will get, to see what we already knew – that Tessanne is an amazing singer who enchants her audiences. Not only with her beautiful voice, but with Jamaican grace and charm as well. Dj Speng of Calico Mix Machine in NYC said he knows she won once they chose Celine to collaborate with Tess. Headline Entertainment’s Jerome Hamilton, one of Tessanne’s booking agents, was also ecstatic over the win. “I expected her to win. It is a great win for Tessanne the artiste, and a great thing for Jamaica. It is a wonderful opportunity for her and it will once again shine light on Jamaica,” Hamilton said. Damion Crawford, the state minister in the Ministry of Tourism and Entertainment, was also in high spirits. “It is with great pride that I congratulate you on a well-deserved victory. Words cannot adequately convey the sheer joy and admiration that all Jamaicans, at home and abroad, feel about your decisive win,” said Crawford. ZJ Bambino said he was fully aware of Tessanne’s talent and that she was the best vocalist on the show. “I am just really happy for her, and where I am right now, everybody is just really happy and excited,” he told The Gleaner. Meanwhile, Opposition Spokesperson on Youth, Sports, Culture, Entertainment and Gender Affairs, Olivia ‘Babsy’ Grange, was singing nothing but high praise for Tessanne. “Jamaicans at home and abroad are singing Tessanne’s praises at this time. She has not only showcased our country in a positive way, but has highlighted and reflected the tremendous talent, tenacity and determination with which Jamaicans are associated,” Grange said in a press release. After 12 weeks of competition, the night was nothing but wonderful for Chin who broke down in tears as she was announced the winner. She finished ahead of Jacquie Lee, who secured second and Will Champlin, who finished third. Although teary-eyed, Chin sang her first post-victory single, Tumbling Down, written for the competition’s winner by Ryan Tedder of One Republic. Earlier on the night, Chin got the opportunity of a lifetime to perform alongside musical icon Celine Dion. Pre-show footage also showed Chin and the other finalists being surprised with their pick of motor cars courtesy of Kia Motors. The night also featured performances from all the top 20 contestants on the show, One Republic, Paramore, Ne-Yo, Christina Aguilera and Aloe Blacc.